This complete all-in-one Mass Gain formula was developed to help pack on insane amounts of quality muscle weight. This delicious tasting high calorie shake contains only the highest quality ingredients that deliver a massive 900 calories of premium quality nutrients with the perfect ratio of Protein, Carbohydrates and Fats to promote increased lean muscle growth, strength gains and accelerated tissue repair. FOUR STAGE CARB SYSTEM fuels your body with both fast and slow release carbohydrates for monster energy, with both Maltodextrin and Waxy Maize Starch your body will be primed ready for brutal workouts without giving you that bloated overly full feeling that many inferior gainers often do. HYPERBOLIC POWER STACK leaves nothing to chance with a shotgun blast of CREATOR Creatine for increased muscle cell volume and increased power, HMB for increased lean muscle gains and protection from muscle breakdown and Glutamine the amino acid that acts as the building blocks for muscle growth and quality weight gain your body is 100% covered for maximum gains. 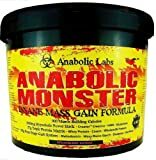 ANABOLIC MONSTER should be taken 1-3 times daily, for optimum results take between meals to ensure the body is continuously fuelled for maximum growth and accelerated weight gain. On training days consume one of these servings immediately after your workout to aid recovery and promote muscle growth. For a monster 900 calorie shake mix 2 scoops (140g) with 1 pint of semi skimmed milk in a shaker or blender. For a lighter shake mix 2 scoops with 1 pint of water or 1 scoop with half pint of skimmed milk.